The Gaesatae were a Celtic mercenary force derived from ‘about the Alps and on to the Rhone’ (i.e. – Transalpine Gaul) who were recorded as joining the combined armies of Cisalpine Gauls including the Boii, Taurisci and Insubres in an attempted attack on the Roman Republic in the late stages of the 3rdC BCE. Like the other Celtic ‘tribes’ seen in the post-4thC BCE Europe (during the ‘La-Téne’ material culture period) they were a group based around military exploits rather than of familial and geo-cultural origins. Of particular interest was their tendency (like the later Norse Berserkr warriors) to go into battle naked, except for their weapons and shields. This tactic – also noted to be practised by the Galatians and other factions of central European Celts following the 4th/3rdC expansion. It was likely to have allowed them to be highly mobile, to demonstrate their apparent bravery (or fanaticism) to their enemies, and no doubt to intimidate with their magnificent physiques – a point not lost upon Greek historian Polybius. The image of the naked Gaesatae or Galatian warrior has therefore been a romantic and enduring one, not in the least because of the powerful statuary image of a dying Gaulish warrior, naked except for his neck torc, that survives from ancient Rome – possibly being a copy of a Hellenistic original from the 3rdC BCE. 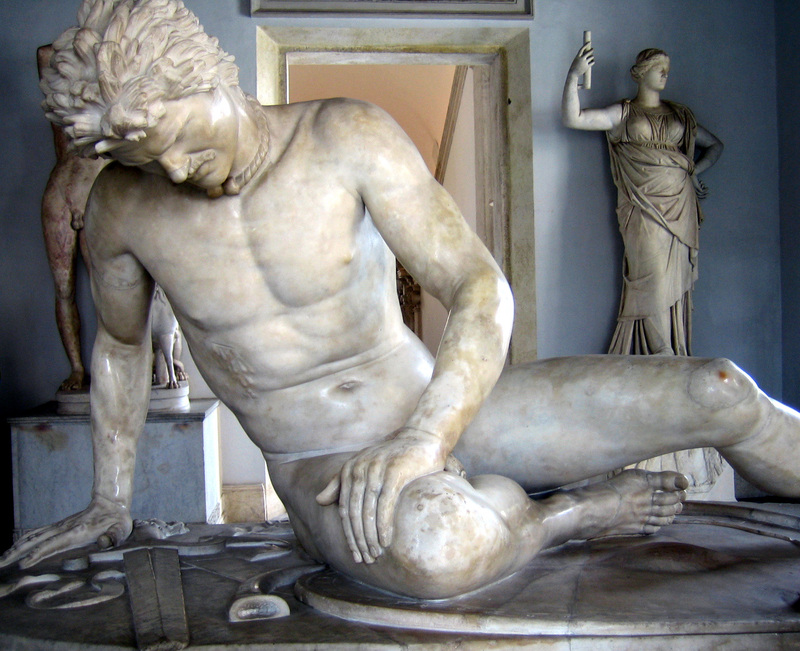 The ‘Dying Gaul’ or ‘Dying Galatian’ from the Capitoline Museum. 1. The promotion of a warrior cult which saw death as a brief transition through the Otherworld, or a permanent place in the Celtic notion of ‘Elysium’ as a future ‘hero-helper’ of the people. This promoted a fearlessness and fanaticism which gave these warriors a widespread reputation without which the Roman Republic and Empire (who employed them as mercenaries and allies) would not have succeeded. 2. The stimulation of a weapons and armour industry and tradition within the Balkans and Eastern Europe (e.g. – chainmail and the longsword) which would give birth to the future armoury traditions of the middle ages, supplying technology to both Europe and the East. 3. The idea of the highly-mobile, rapid-response infantry and cavalry army created from across tribal boundaries. These warbands – like the legendary Irish Fianna – provided Celtic society with an outlet for their warlike ways which could remove aggression and conflict from home-soil and export it to bring back wealth and plunder. The Roman Empire thrived upon its ability to deploy legions of Celts and other similarly-motivated foreigners to do their ‘dirty-work’ and relied upon the military developments of Celtic Europe between the 5th and 1stC BCE in determining the format of its conquering armies. In a way, it is possible to consider that the Roman legions took their lead (as well as many of their men) from the militarist fanaticism of the Celtic world. 4. The wealth from the 4th and 3rdC BCE Celtic warband conquests was a potent stimulus to culture and trade, as well as migration and mobility of cultural groups. The ‘Scoridisci’ culture of Eastern Europe was a remnant of the 3rdC BCE wars and expansions, as was the Galatae Celtic groups in Anatolia (modern Turkey). The Belgae of northern Europe, the Volcae-Tectosages, and the Boii people of northern Europe and Cisalpine Gaul were all important trans-ethnic groups who had cultural origins in such martial exploits during the La-Téne period. The supposed ethnic-tribal group (according to the Romans) of northern Europe known as the ‘Belgae’ were almost certainly a part of this movement which blurred ethnic and linguistic boundaries, and whose cultural influence extended from west of the Rhine to the Atlantic and the British Isles. However, these fell into decline after the 1stC CE following on from the Roman conquests, their identities dissolving with Romanisation, and their warlike culture (like that of the Scottish Highlanders after the 18thC) being employed in the imperial army in a cunning piece of cultural engineering. However, there is no reason to suspect that the culture did not continue beyond the limits of Roman influence in Scandinavia, Germany, northern Britain and Ireland. Due to linguistic and other reasons, the Romans did not identify these peoples with the potent ‘Gaulish’ Celts and their fanatical druid-led religious system. There are many reasons to suspect that they held the same religious and cultural views, however – the powerful image posed by the naked Viking Era Odinist Berserker being one such reason, along with the many parallels I have already discussed.